This Junior Suite Villa is the Perfect size for couples or couples with small children! Completely remodeled condo with new floors and granite counter-tops. New Mattresses with an additional memory foam topper for both the Bed and the Sleeper Sofa. Private Balcony with seating for 2 outside to enjoy cocktails on the patio enjoying the view. Located on the First Floor with no steps to maneuver. New furniture and linens and tastefully decorated and supplied with all the amenities of home. Everything needed for the beach in included - beach chairs, coolers, snorkel gear, and coozies. Enjoy Netflix entertainment, cable television and free WiFi. 24 hour security and in-room safe. On-site Amenities include 3 pools located in different areas of the complex - all with a different but great view! Nature Trail, "Intimate" Beach and 2 amazing Restaurants - Shoreline Bar & Grille, our more casual restaurant right on the water serving yummy food and great drinks and Mirador by Chef Benny for Dining and Sunday Brunch. Walk to Margaritaville and Coki Beach. 2 minute drive to Lindquist Beach and a 5 minute drive to Red Hook and the ferries to St. John and the British Virgin Islands. 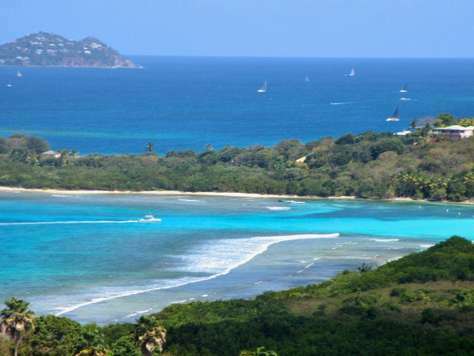 World Famous Magens Bay is a short 10 minute drive away offering calm waters, Paddle Board Rentals, snack bar, beach boutique, and relaxing in the Sun or Shade. Family oriented. If you're into Dining and/or Nightlife there are many options available. Mirador by Chef Benny is located at the Terrace Level of the Resort. Or drive to Red Hook; just a 5 minute car ride away where you will find many bars and restaurants including our favorites, Island Time Pub (with great Pizza) and Tap & Still for Yummy Burgers and Fries. A romantic dinner can be had at XO Bistro. Pesce Opening Soon. Exploring the East End? Stop at Secret Harbour for their famous Happy Hour. Had a long day at the beach? Stay in and cook in our full kitchen. Don't want to go grocery shopping? Let us do it for you or download the App STT Direct! After a 5 minute drive to Red Hook, there are ferries to St. John (no passport required) and to Tortola, Jost Van Dyke and other islands in the BVI (passport required). Take the car ferry to St. John packed with your beach supplies and spend the day exploring and enjoying the beautiful beaches of St. John. Did someone say shopping? Don’t forget to head downtown, Havensight, or to the beautiful shops at Yacht Haven Grande and snap up great deals on jewelry, cameras, electronics and souvenirs for your friends and family. Beside the lower cost, all purchases are tax free! Make your next Vacation an Escape to our spacious 1200 square foot condo with a Private Balcony Overlooking the Ocean, Sugar Beach with views to St. John and the British Virgin Islands. Pearl of Paradise is located on the East End of St. Thomas. This home away from home is located at Point Pleasant (but not part of the "hotel program"). The East End and Red Hook area contains the heart of the boating industry; great Day sail, powerboat, snorkeling charters available within minutes of our place. Perched on a hill, you will enter to a large open living room and kitchen floor plan that offer breath- taking views. Our condo has a fully equipped kitchen. Groceries are on your own but we do not believe you should start a rental with nothing. We provide you with a bottle of Rum, Coke, Orange juice, muffins for breakfast, and a pot of coffee for your first day. We provide you with a welcome packet via e-mail so you know where to shop for food and liquor. We provide all linens including beach towels. Make sure when you hit the beaches you bring the cooler, beach chairs, beach bag and snorkel gear provided. Spend the day relaxing on the balcony with one of the lounge chairs. Enjoy your meals outside on the large table which will seat 6 comfortably. “Pearl of Paradise” boasts privacy for two couples. You can enjoy privacy in the separate bedroom, which offers a King size bed, with a feather pillow topper for ultimate comfort. This bedroom has its own beautifully remodeled master bath with shower and double sinks. If you plan on traveling with family or friends the couch converts into a sleeper sofa. Not just a sofa sleeper where a bar slams into your back at night. The sleeper has been upgraded with new Upholstery, and a Deluxe Cool-Max sofa mattress with Memory and Gel infused foam. For larger groups, there is an additional queen size air bed which inflates to 14 inches of comfort. The air pump is electric operated. Babies or toddlers in your group, you can leave your traveling crib at home. The condo has a Pak-N-Play with sheets provided. There a separate remodeled second bath, complete with shower off the living room. If you choose to check in with family, friends or the office while on vacation WE OFFER FREE WiFi. You are a few steps away to the lovely middle pool where you can enjoy one of the best views of the BVI and St John. Steps away from our place is the friendly restaurant, Mirador by Chef Benny overlooking the water or take a nature trail down to our romantic just-for-two beach. Walk on Down to the Shoreline Bar & Grille right on the water - one of St. Thomas's famous restaurants as it's right on the water! Besides Pizza Pi (a Pizza Boat on the Water), there's no other restaurant in St. Thomas on the water this close! You can walk to Coki Beach or if you’re carrying beach chairs and the cooler, it’s a quick drive. At Coki, you will find incredible snorkeling and diving. There is a dive shop on site at Coki. Kids and Adults alike will enjoy Coral World. Megans Bay is about a 10 minute drive and always rated one of the top 10 beaches every year! Our favorite relaxing beach, Lindquist Beach (Smith Bay Park) is just a 5 minute drive away. As our guest you can use any of the three pools, the Nature Trail, and our small intimate beach. 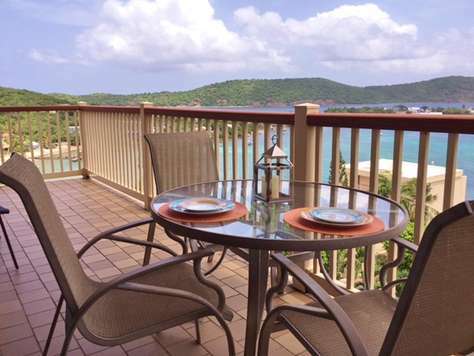 Relax on the balcony, explore St. Thomas and St. John, make memories, wear flip flops and enjoy your stay! We want to ensure that you have a great vacation, feel free to contact us or our on-island representative with any questions you may have. Once inside you will see the newly remodeled kitchen, including all new cabinets, granite counter, cook top, microwave and more. Comfortable outdoor furniture. Washer Dryer for Guests' use. Mirador by Chef Benny is now open with amazing views and now serving breakfast, lunch and dinner! This ideal corner location, allows you to open all the sliding glass doors on both sides of the wrap around balcony to take in the amazing ocean views and allow the tropical breezes all night long. Everything has been provided in this one bedroom, superior suite condo for maximum comfort and to make you feel welcome. Master bedroom has curtains to separate from Living room area. There is a California king size bed with pillow top mattress, along with a comfortable queen size sleeper sofa in the living room. One bathroom with two doors, insures privacy to both couples. Outdoor living is the preferred choice of most guests. Hilltop Hideaway is situated hillside for maximum views. There are 3 different pools to choose from: shoreline, terrace and hilltop. Great snorkeling is along the shoreline here, with the beautiful white sand of Pineapple Beach, just next door; is an easy walk away. Local manager is happy to answer any questions or suggest fun things not be be missed ! 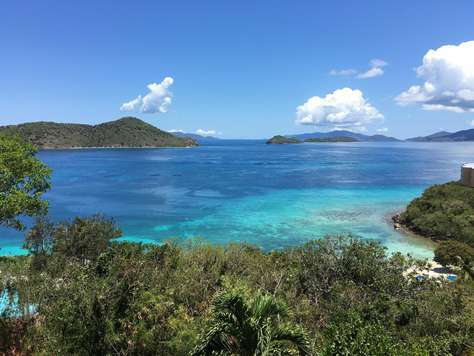 Plan to spend at least one day on our sister island of St. John, only a short ferry ride away. Wake up every morning to the sounds of the ocean and beautiful sunrises while having your coffee on the balcony. The condo is 1 bedroom 1 bathroom that sleeps 4. It has all the amenities of home. Newly remodeled kitchen with all new stainless steel appliances, granite countertops and beautiful cabinets. The kitchen is equipped with a new refrigerator , microwave, two burner stove, coffee pot, toaster, and blender. The kitchen has everything you need to spend an evening in. It also comes with an Ipod docking station so you can listen to your favorite music while enjoying cocktails on the balcony. Their is a flat screen TV with satellite/cable. The condo also has wifi. The bathroom has been upgraded with a new vanity, mirror, sink, and tiling in the shower. Their are 2 fans. One over the bed and one in the main room. The condo has AC for the really hot nights! Lindquist is a beach that is a mile away. The cooler will come in handy at this beach . The beach and water are so beautiful that it is worth spending a day there. Coki Beach is known for great snorkeling! You can walk there from our condo! When you are standing on the balcony look straight across the bay and that's Coki. Also there are the British Virgin Islands that have beautiful beaches and fun day trips. One of our favorites is Jost Van Dyke. Visit Soggy Dollar Bar and White Bay. You will truly love relaxing on the private balcony overlooking the ocean and it's amazing colors and hearing the sounds of the water. It will take your breath away! It is a sight that everyone should enjoy in their lifetime! This unique resort is located on a hillside on the East End of St Thomas with fabulous views from the wrap around porches in our villa. On a clear day, which is about every day, you can see as far away as the British Virgin Islands. Our unit can comfortably sleep 4, with a king sized bed and a full sized pull out couch. Views from every room! The balcony wraps from the entrance to the bedroom, across the living and dining rooms. The bedroom can be left open or closed off for privacy with expandable doors. A separate locking door keeps the balcony private for dining, cocktails, morning coffee, and just relaxing and taking in the views. The unit has a fully stocked kitchen, including coffee maker, toaster, and the all-important blender. Easy for cooking meals if you choose, or enjoy Mirador by Chef Benny, open for lunch, and dinner and has a fabulous Sunday Brunch! Or walk next door to Margaritaville for evening entertainment and dining. You can also take the short drive to Red Hook where you will find many restaurants and bars ranging from Duffy’s Love Shack for casual to the more romantic XO Bistro or Pesce.The Tap & Still Brew pub has the best burgers and fries, and a selection of microbrews. Red Hook has ferries to St. John (no passport required) and to Tortola and other islands in the BVI (passport required). Take the car ferry to St. John packed with your beach supplies and spend the day exploring and enjoying the beautiful beaches of St. John. Or leave the car and enjoy a leisurely stroll to the many shops and restaurants. If you want additional shopping, head downtown to Havensight, or to the beautiful shops at Yacht Haven Grande for great deals on jewelry, cameras, electronics and souvenirs for your friends and family. Beside the lower costs, all purchases are tax free! Your hosts provides a cooler, beach chairs, and snorkel equipment free of charge. While taxis and shuttles are available, your hosts recommend renting a car during your stay for greater flexibility. Choose between one of the 3 pools at the Resort, with a unique view from every one. Also, take one of the many nature trails on the property for even more amazing views of St John and the BVI. One of the paths will lead you down to secluded Sugar Beach, a great place to relax and watch the sunrise. Or try to pick a favorite from among St Thomas’ world class beaches. Lindquist Beach (Smith Bay Park) is a quick 3 minute drive to the east, but has limited facilities, so feel free to pack the cooler and beach chairs, provided in our villa. 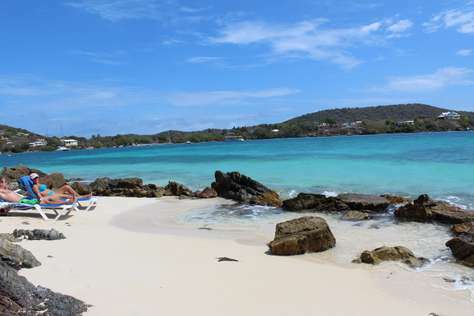 For a beach with more amenities, travel 15 minutes to Magens Bay voted one of worlds top 10 beaches. There you can enjoy chair rentals, shower facilities, snack bar and gift shop, not to mention bar service at the water's edge. Coki beach, a 10 minute walk boasts some of the best snorkeling and diving on the Island. Dive equipment is available for rent on Coki, and you can see many varieties of coral as well as turtles, eagle rays and several types of tropical fish. St. Thomas has many other attractions available such as: Coral World Ocean Park for snuba diving, shark encounters, Sea Lion Swim, and Turtle encounters, not to mention plenty of fishing, and boating opportunities. Our villa is cleaned before and after your stay but for a small additional fee can be cleaned every other day. Cable TV and FREE wi-fi internet in the villa. • Balcony with outdoor furniture overlooking the grounds and Water Bay – perfect for having morning coffee or an evening cocktail. Set up on the hillside of the Caribbean Sea from the northeast side of St Thomas the views are spectacular allowing you to view St John and the British Virgin Islands. You get ocean breezes in the condo being on the hill, and the views of the resort are lush with tropical landscaping, and lit walking paths throughout. Only 3 miles to the city of Red Hook where the ferry to St John and BVI is located along with shops, boats, restaurants, and bars to suit any taste. Enjoy sugar beach at the resort- small but very beautiful. Or enjoy some time in one of the 3 pools each with a different view. The restaurant, Mirador by Chef Benny is great for lunch and dinner and Sunday Brunch along with fabulous cocktails. All this without leaving. Shopping for everyone's tastes. For the more upscale shops, try Yacht Haven Grande where you can shop, eat, drink, and look at some of the most beautiful privately owned yachts...one can dream. Downtown Charlotte Amalie has one of the busiest duty free ports in the Caribbean. Eat, Drink, Shop, repeat. Getting around the resort does require walking up and down the hills, so be prepared. We have a nice nature trail, all paved - but hilly. We love the views, and landscaping, and a great way to exercise without really trying. Take this path all the way down to beautiful, intimate Sugar Beach. Also, although taxis - in many varieties - are always available, we do recommend renting a car. And yes, they drive on the left but it actually is not as challenging as you might think. The roads are a bit windy, so no one goes very fast. NO RESORT FEES, NO RESERVATION FEES, VRBO Fees or Airbnb Fees when you book directly with us! Talk directly with the Owner for personal attention and service. You just found your vacation home! Located on the hilltop, we are ideally situated at the East End of St Thomas out of downtown and cruise ship traffic, yet easily accessible to restaurants and shopping or a day at the beach. This upper villa offers a private balcony to enjoy morning coffee, lounge during the day, or star gaze at night with no unit above to block the view. Drop your bags and enjoy complimentary arrival rum and coke while you slow down and get settled. Take in the open feeling created by 20-foot vaulted ceilings and continue through the split-level layout to the living room area to take in one of the most amazing views on the island. Open the expansive sliding doors, smell the salt air, and enjoy tropical breezes. Your island holiday has begun! The unit has a remodeled bathroom, and kitchen appliances have been updated to include a 4 burner cooktop stove and traditional oven. Other kitchen extras include a variety of spices, food processor, rice cooker, countertop griddle, and coffee grinder (bring your favorite beans!). Your hosts provide beach towels and snorkel equipment free of charge, and a variety of water sports and excursions is also close by. Taxis and shuttles are available, but your hosts recommend renting a car or arranging a car service during your stay for greater flexibility and the option to come and go at your own pace without having to make a call or spend precious vacation time waiting for a ride. After a day of shopping in town or relaxing on the beach, put your feet up and watch your favorite DVD. The entertainment center includes a flat screen HDTV with BluRay player and stereo with an iPod dock, and there is also a 36-inch flat screen television in the bedroom with DVD player. Upgraded in-room WiFi is also included in your rental. Stay connected and get top quality broadcast entertainment! You might even send a picture or two of your amazing island getaway to friends and family back home. Choose between 3 pools at the resort or visit one of St Thomas’ world class beaches. From your balcony, you can see Lindquist Beach to the east...the Owner's personal choice. Pack the cooler provided in the entry closet; make sandwiches, grab some chips or fruit, and enjoy a beach picnic. For more beach amenities, travel 15 minutes to Magens Bay. There you can enjoy chair rentals, shower facilities, snack bar and gift shop, not to mention bar service at the water's edge. End your day with a ferry ride to St John and look back to see an inspiring sunset over St Thomas. It is all about the view, privacy and serenity you will enjoy in this upper unit at the top of the hill. Expansive vistas of 9 beautiful islands with no balcony above you to block the sky view. Make Heavenly Hilltop your next vacation! NO RESORT FEES, NO RESERVATION FEES, VRBO Fees or Airbnb Fees when you book Direct! No expense has been spared in the renovation and decoration of this gorgeous split level villa. One bedroom with a King Sized Bed and a Queen Sleeper sofa. The spectacular views of ocean, islands, beaches, dawns and moon rises will leave you in awe. Your wrap around deck offers you more views of countless islands on two sides. Beautiful Sunrises and Sunset Reflections on the Balcony. With a cover for shade, your huge private deck is the perfect setting for drinks, al fresco dining and star gazing. See and do more of what you want with our Free Virtual Concierge service. Simply Heaven is a pristine, lovely residence with attention to detail. We want to make your vacation comfortable. It is the perfect place for an anniversary celebration, honeymoon or even that special proposal or anyone who wants to spend quality time with each other. On the hilltop, a pool can be found that barely has any visitors and is quiet and tucked away. Ready for more action, head to the Terrace Pool by Mirador Restaurant where you can grab drinks and head down to the pool and enjoy. FREE WiFi and a new 40 inch flat screen Smart TV to watch Netflix or any other of your internet based subscriptions. There is a stereo in the condo to enjoy your favorite selections. LOCATION: Perfectly located off of the top parking lot across from Point Wellness (currently closed due to Hurricane damage), Simply Heaven is easily reached just steps from your car without hills to climb or steps to walk. Suitable for most people with disabilities (please ask). We specialize in honeymoons, wedding parties and anniversaries. Book ours and others located close by to have everyone together. Just Remember, by choosing and booking with us, there are NO RESORT FEES, NO RESERVATION FEES, VRBO Fees or Airbnb Fees. The holiday paradise ... 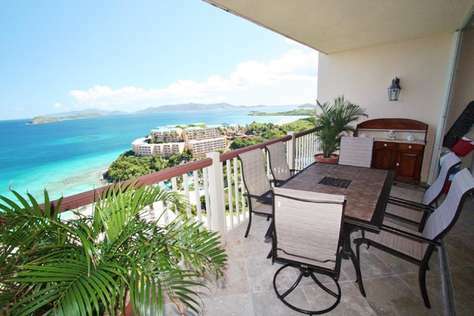 Superb condo for rent: fully furnished 600 square feet for 4 people in St. Thomas, U.S. Virgin Islands, USVI. NEW Full kitchen (2017), LCD TV, DVD, AC, snorkeling gear, beach chairs, condo completely renovated, heavenly view of the Caribbean Sea. 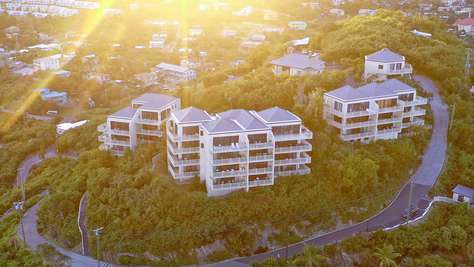 The condo is located 10 mins from Redhook, 15 minutes from Charlotte Amalie, the capital of the diamond without taxes and 15 mins to Magens Bay beach, the last Twilight movie beach. If you like diving, a PADI 5 star center is 5 minutes from the condo. You have access to 3 swimming pools, a baby crib and an on-site Restaurant, Mirador. The Spa and gym were damaged by the hurricanes and will not open until late 2018. Freedom, the bucolic scenery, tranquility, beauty! This is what we offer for your holidays this year in St. Thomas, a U.S. Virgin Island in the Caribbean Sea! Our newly renovated condo will satisfy all your needs. With its breathtaking views, you will be completely out of place in your life. Each morning, snorkeling or scuba diving in the sea in front of our condo or our three pools mountainside for… Reading! In the afternoon, Charlotte Amalie and its jewelers and shops without taxes will always be present. 36 public beaches all different from each other will satisfy you! La liberté, les paysages bucoliques, la tranquillité, la beauté! C’est ce qu’on vous offre pour vos vacances cette année à St Thomas, une ile vierge américaine dans la mer des caraïbes! Notre condo fraichement rénové comblera tous vos besoins. Avec sa vue à couper le souffle, vous serez complètement dépaysé de votre quotidien. Le matin, l’apnée ou la plongée bouteille vous attend, sinon nos trois piscines à flanc de montagne sauront parfaire votre bronzage. L’après-midi, Charlotte Amalie et ses bijouteries et boutiques sans taxes seront toujours présentes. Les 36 plages publiques toutes différentes les unes des autres sauront vous combler! NO RESORT FEES, NO RESERVATION FEES, VRBO Fees or Airbnb Fees when booking directly with us! 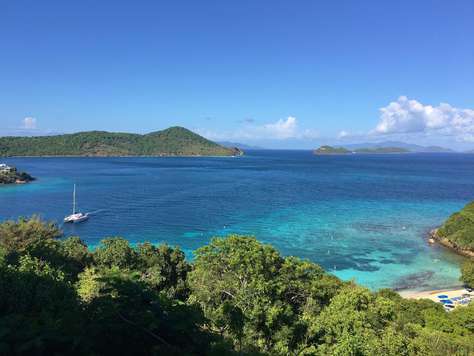 The villa has a large, private wrap around balcony with views of Coki Point, Lindquist Beach, St John, Tortola and Jost Van Dyke, hence the name Down Island Dream! Enjoy the tropical breezes as you gaze into the many shades of sparkling blue of the Caribbean Sea. On your way up the hill to your villa, you will see the most beautiful greenery and tropical flowers welcoming you to the complex. The villa is a short walk from your car and only a few steps down to the front door. Then, as you first walk into your island home, you will be greeted by cooling trade breezes and the most incredible views from every angle. You may not be able to resist staring into the water below and the islands beyond . There is a view of the sea from the remodeled kitchen which has granite countertops, stainless steel appliances, coffee maker, toaster, and all the comforts of home. And of course a blender and ice maker in the freezer to make those refreshing tropical cocktails to enjoy on the balcony! The remodeled bathroom includes a glass bowl sink and natural stone shower with a luxurious rain shower head. We also provide complimentary toiletries for your stay. Your island home will welcome you with rum, a mixer, coffee and a few snacks to enjoy on the balcony. The resort is located on the East End of the island, within minutes of the best beaches on St Thomas. You may not be able to leave the views on the balcony, but you can walk to Coki Beach for great snorkeling. Lindquist Beach is less than 3 minutes away! Pack the supplied cooler and head out for a day in the sun. The location is also convenient to Red Hook and the ferry dock. Red Hook is the home of so many restaurants and shops to visit and a full service grocery store. Or hope on a ferry to St John to explore the many beaches there. Pleasant Hideaway is located in the middle of this Hillside Resort and offers easy access to two out of three pools and close to Mirador Restaurant. There are several steps leading down from the street level (and why it's hidden away) where you will arrive to the large wrap around patio with lots of seating to enjoy the views. It has a small yard with a great hammock to enjoy reading a good book in the afternoon after your daily adventures! Once inside Pleasant Hideaway the living room area includes a comfortable sofa for guests, chairs, and a TV creating the perfect place to relax and take in the views. The Kitchen comes fully equiped with everything you need to prepare meals. Enjoy eating indoors or outside on the large dining area on the balcony. The main bedroom has a king size bed and opens to the living area. A full bath with stand-up shower can be accessed from the kitchen or the bedroom. There is an additional bedroom with a double bed adjacent to the dining area, which also has access to the large wrap around patio. 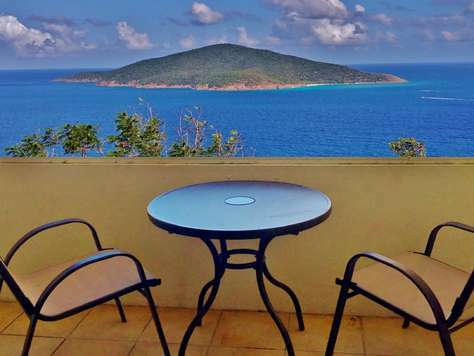 Pleasant Hideaway is located on the eastern end of St. Thomas and has amazing views from every spot on the resort! Mirador by Chef Benny serves lunch and dinner and has an amazing brunch on Sundays. Try Thursday nights for Chef Benny's themed Puerto Rican night! By choosing and booking with us, there are NO RESORT FEES, NO RESERVATION FEES, VRBO Fees or Airbnb Fees. 2 BR/2 BA Sleeps 6-8. Nine Island Vista, is located on the East End of St. Thomas. You’ll love the tremendous views (you can see unobstructed views of nine islands from the 50' wrap-around private terrace) and being able to walk to three beaches (Pineapple, Sugar, Coki). Mirador restaurant serves lunch and dinner and has an amazing Sunday Brunch! Jimmy Buffet's Margaritaville resort and bar/restaurant (our neighbor resort), has a restaurant and a great beach a short 10 minute walk away. The villa is great for families - there are 3 pools throughout the property each one with a different view! One down on the shoreline, one in the middle of resort (down from Mirador Restaurant) and one steps away from the villa. Two bedrooms/2 baths, 1 bath has tub/shower combination. Located at the top of the hill affording breathtaking views of the ocean and 9 islands and cooled by gentle trade winds. Each bedroom has its own air conditioner and the great room is cooled by ocean breezes. Fifty foot wrap around deck for true indoor to outdoor living . Open concept for plenty of space. Three flat screen tv's. Well stocked kitchen. Beach towels, snorkeling equipment, and noodles provided to take out with you on your daily adventures. Beautifully Decorated 2 Bedroom 2 Bath Condominium at Mahogany Run on the Upper Level. Cathedral Ceilings throughout - private balconies in each bedroom with amazing views to Hans Lollick and beyond. Outdoor Seating for the entire family on the living room balcony. Full sized stocked kitchen to cook in after a day of adventures on St. Thomas and St. John. We provide you with linens, beach towels, coolers, snorkel gear and everything you need for a great day at the beach or exploring the Virgin Islands. Mahogany Run is a gated community on the Northside of St. Thomas located within a mile of world famous Megans Bay. Head to Red Hook on the East End within 10 minutes - or downtown Shopping also in 10 minutes. Centrally located but in a quiet peaceful community! Enjoy the pool in the evening after a day of exploring! This one bedroom, one bath condominium with an amazing view from the entire condominium sleeps four! KIng Sized Bed and queen sized sleeper sofa. 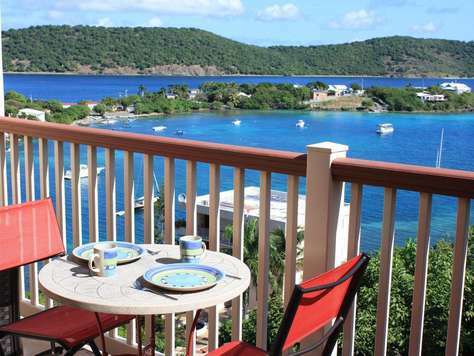 A balcony with views to St. John and beyond to the BVI will have you on island time the minute you walk in the door. Remodeled kitchen and bathroom with everything you need to stay at home and cook if you want or make frozen cocktails while relaxing in between exploring the Virgin Islands. 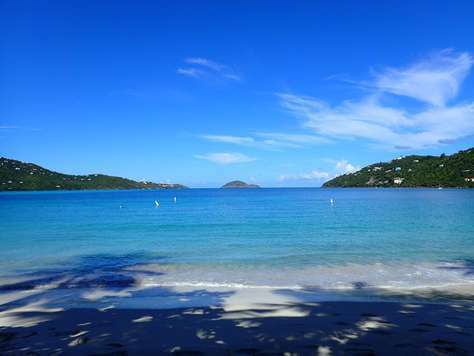 Located on the East End of St. Thomas in between Coki Beach and Lindquist Beaches. This condo is an independently operated villa rental located within the Point Pleasant Villa Owners Association (PPVOA) Condominium Property but is not part of any Resort Hotel Program. The biggest and best difference between renting directly with us and a unit only available through the Resort Hotel Program is that we don't charge extra resort fees! Each and every guest enjoys the benefits of 24 hour security and the three (3) pools on site. A relaxing, quiet place to stay while adventuring out and enjoying our beautiful Virgin Islands! We provide our guests with a welcome package including a list of our favorite things to do (Help us add to the list by providing us with your favorites), helpful hints and directions, allowing you the freedom to explore all the islands have to offer at your own pace. We highly recommend renting a car while on island - it is truly the best way to explore all we have to offer! Don't limit yourself to staying in one spot or relying on taxis. Remodeled 1 BR/1BA Condo with Wrap Around Balcony with expansive views and great breezes! 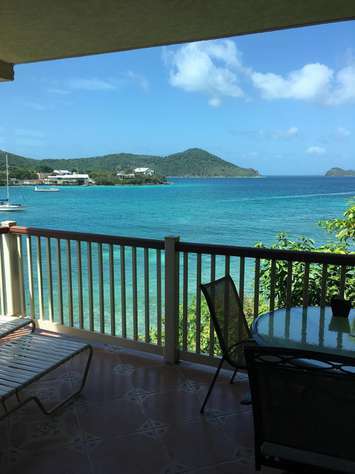 Quiet and peaceful, Coral Breezes is tucked away on a hilltop with a wrap around balcony which is the best place to sit peacefully and enjoy the expansive views to St. John, the hilltops of the East End and Lindquist Beach. St. Thomas features many wonderful restaurants within an easy drive or taxi ride. Our kitchen comes fully equipped to dine in at home. Make sandwiches, grab some drinks, pack the cooler, grab the beach chairs and towels and explore St. Thomas on your own time by renting a car. 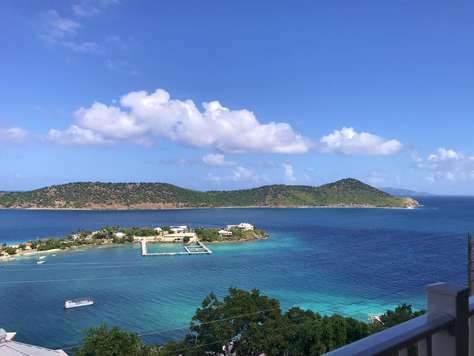 We are located on the east end of St. Thomas just five minutes from Red Hook, home to the ferry boats to St. John. Red Hook also has a variety of restaurants and bars to enjoy and choose from! Check out Shoreline Bar & Grille on property, where great food and drinks can be had on the water's edge! Less than 1/3 of a mile away in one direction is Coki Beach, where the snorkeling is great and where you can learn to Scuba Dive. 1/3 of a mile to the East is beautiful and peaceful Lindquist Beach. Traveling to St. Thomas is easy. 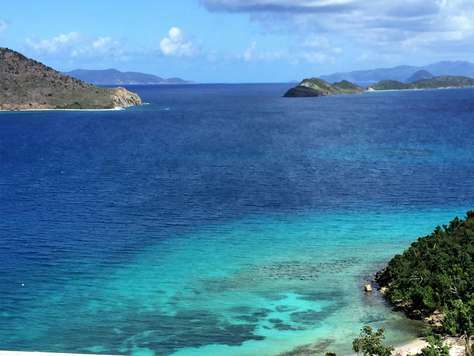 A U.S. Passport is not required unless venturing over to the British Virgin Islands. We are only 8 miles from the Airport. Located on the East End, nestled between Margaritaville and Sugar Bay, this spacious 2 bedroom/2 bath condo is perfect for your family vacation. Full kitchen to make snacks before going out exploring for the day! Both bedrooms have King Sized Beds and their own bathrooms. Just a 3 steps to enter into condo! There are three (3) pools to enjoy, a small intimate beach for an early morning hike, Shoreline Bar & Grille right on the water serving breakfast, lunch and dinner! The entire complex is set on a hillside so getting around from the top of the hill (where we are located) to the bottom and back is the best workout! Your whole family will enjoy our spacious condo, free unlimited WiFi and cable tv for the downtimes! Read a book on our spacious balcony enjoying the breeze and the Views! You can't help but be drawn to the expansive balcony and the views - they are stunning! Cloud Nine Villa with its cathedral ceilings and the 2018 complete remodel including the kitchen and bath will make you never want to go home! New flooring, new furnishings and designer touches throughout will make you feel pampered. And the whole villa is yours for your vacation! King Sized bedroom that can be closed off from the living area if you choose. Sleeper sofa if you want to bring the kids along.